Hertha Berlin continued their recent climb up the Bundesliga standings courtesy of an impressive 4-0 win against SV Darmstadt 98 at the Merck-Stadion am Böllenfalltor on Matchday 16. With Vladimir Darida pushed up into the playmaking role, Hertha set out their attacking stall early. Pal Dardai’s men almost had the lead in the eighth minute when Vedad Ibisevic struck wide from close-range, but the Bosnia-Herzegovina international made no mistake from a similar position five minutes later, guiding Salomon Kalou’s cross past Christian Mathenia. The early goal allowed the capital-city outfit to ease their original high pressure and sit deeper, looking to threaten on the break. Darmstadt, attempting to chase the game, went further behind in the 26th minute when Marvin Plattenhardt’s inch-perfect free-kick sailed into the top corner. The hosts, whose only first-half chance came through Fabian Holland, should have cut the deficit through Jan Rosenthal, but he was denied by Rune Jarstein’s one-handed save moments before the break. It took Hertha just five minutes after the restart to capitalise and increase the lead, John-Anthony Brooks nodding down for Ibisevic again to poke home from mere yards out. With the game sewn up, Hertha duly shut up shop, and although Darmstadt came close through Mario Vrancic’s long-range effort, the visitors had the final say when Kalou rounded Mathenia late on and poked home to round off the scoring. In scoring his third double of the season, Ibisevic was the visitors’ star man, with both his goals perfectly showcasing his innate goal-poaching ability. 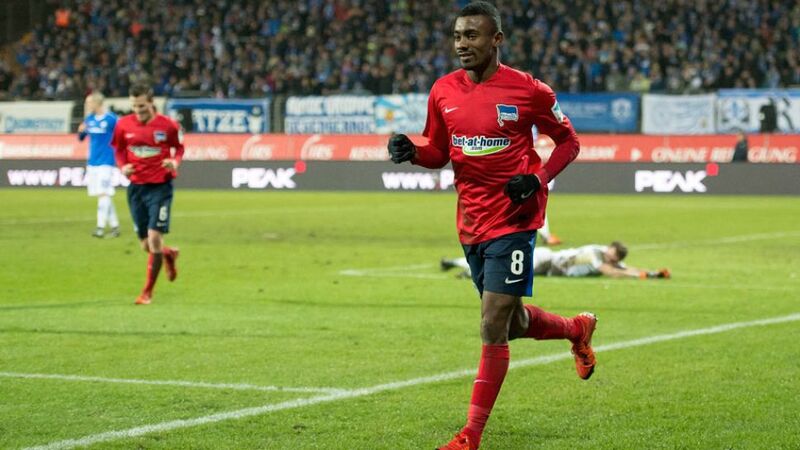 While Hertha’s defence has been the rock on which this season’s success has been built, in Ibisevic (and Kalou), the capital-city outfit finally boast a reliable goalscorer. While last week’s victory Bayer 04 Leverkusen was impressive, this was the type of victory which underlines Hertha’s genuine credentials as a candidate to finish in the European places. Dardai’s men were simply a class above a Darmstadt side who have been tough to beat at home this season. Hertha are yet to lose this season after taking the lead.Ibisevic has six goals this season: the Bosnia-Herzegovina international has scored a brace on three separate occasions.Plattenhardt scored his first goal in a Hertha shirt.The Berliners have never been two goals to the good so early under Dardai.